We’d love your help. Let us know what’s wrong with this preview of Sleeping Through War by Jackie Carreira. R The year is 1968 and the world is changing forever. During the month of May, students are rioting and workers are striking across the globe, civil rights are being fought and died for, nuclear bombs are being tested, there are major conflicts on every continent, and war is raging in Vietnam. Against this volatile background, three women strive to keep everything together. To ask other readers questions about Sleeping Through War, please sign up. 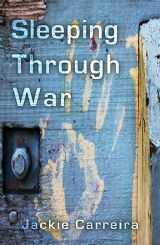 Sleeping Through the War by Jackie Carreira is a 2018 Troubador publication. When looking back on the 1960s, the entire decade is often described as ‘turbulent’. This is true. But, instead of the decade going out with a whimper, it seemed to gain a dark kind of momentum in 1968-69, ending on an unrivaled note of violence and unrest. I was a very young child in the late sixties, unable to completely grasp the gravity of everything going on. But, I’ve always been fascinated by the decade, which spaw Sleeping Through the War by Jackie Carreira is a 2018 Troubador publication. I was a very young child in the late sixties, unable to completely grasp the gravity of everything going on. But, I’ve always been fascinated by the decade, which spawned so many changes in our country, in such a short span of time. Still, as an American, I often think of the things going on here, and only recently started to consider what was going on in other countries. This novel touches on this, but also on the effect the war and unrest had on regular people who were trying to cope with their sons and husbands fighting on the front lines, those left behind, or those just trying to get by, to face the challenges of work, survival, and the struggle to remain mentally balanced under such dire circumstances. But, also highlights the sacrifices made which are rarely, if ever, remarked upon. Stories, like these, that never made it into the public consciousness. The novel centers around three women, all from very different walks of life. This poignant piece of literary fiction also has a basis in fact and hits the reader where it hurts. The prose is vivid and candid, which kept me transfixed to the pages. I think Amalia’s story resonated with me the most, and once you read about the tragic turns her life has taken and the choices she has been forced to make as a result, you will understand why. But, perhaps, it is also because I was mostly ignorant of the situation in Lisbon. Rose is from West India but lives in London. She works as a nurse, where she endures backlash, but she manages, to keep her humanity, selflessly helping those around her with compassion. Last, but not least, is Mrs. Johnson, a woman corresponding with her son, who is serving in Vietnam, through letters, which are ominously unanswered. Her burden of grief and uncertainty is born alone, as those around her lack understanding and are oblivious to her loneliness. Parenthood, real everyday struggles amid a turbulent background, sacrifice, and hard choices are the themes explored in this stark and melancholy novel. It is thought provoking and eye-opening and I am deeply impressed with the author’s efforts to bring these women to life, to give them a voice, and in so doing paying tribute the real women the author encountered in her youth. While the book is often bleak and heart wrenching, it is a long overdue homage, which is, I think, necessary and important. The impact these women had on me was profound, and I will keep them in my heart and think of them often. 1968: both Martin Luther King and Robert F Kennedy are assassinated, Man orbits the moon for the first time, and the Vietnam war rages on... categorized as one of the most tumultuous years in our history... and as an American who was not born until the last two months of the 60s, I’ve never given any thought to the fact that other countries had things going on during this decade... in my defense when we have studied European history in school we generally never m Poignant! Tumultuous! Important! When I first marked Sleeping Through War as finished on my Goodreads I rated it as four stars because I had enjoyed the read and appreciated Carreira's approach to portraying this monumental moment in history. That was a couple of days ago though and the more I have been mulling the book over for this review, the better I think it is! Consequently I've upped that star rating to a five. Sleeping Through War tells the stories of three different women and is set against the backdrop of world events in 1968, a turbulent time of student demonstrations throughout Europe, civil rights marches in the United States, political tension in Eastern Europe and the Vietnam War. Although the backgrounds of the three women are different, they live in different parts of the world and there is no direct connection between them, their concerns are similar: home, family, worries about the future. Sleeping Through War tells the stories of three different women and is set against the backdrop of world events in 1968, a turbulent time of student demonstrations throughout Europe, civil rights marches in the United States, political tension in Eastern Europe and the Vietnam War. Although the backgrounds of the three women are different, they live in different parts of the world and there is no direct connection between them, their concerns are similar: home, family, worries about the future. In addition, the church plays a role in all their lives. Both Amalia, a single mother widowed in the war between Portugal and Angola, and Mrs. Johnson, with a son serving in Vietnam, are coping with the consequences of war. Rose, a nurse recently arrived in England from St. Lucia, is engaged in a different kind of war – a war against racial prejudice and discrimination. The author, Jackie Carreira, is a playwright and therefore used to communicating the stories of her characters to an audience through dialogue. Her skill at this is evident from the stories told in the first person – by Rose and Mrs. Johnson – in which the reader gets a real insight into their thoughts and feelings through the distinctive narrative voice of each. Having said this, Amalia’s story was probably the one I found most engrossing. Left alone to support her son, she is forced to do whatever it takes to earn money to put food on the table, placing herself at the mercy of others as a consequence. You would have to have a heart of stone not to be moved by the letters Mrs. Johnson writes to her son, Rod, in which the cheerful snippets about domestic life back home barely disguise the despair she obviously feels at being parted from him. A final revelation is heartbreaking, but not in the way you may have been expecting. Rose was definitely my favourite character. Although she encounters both casual and overt racism, she responds with kindness, understanding and tolerance to those around her, particularly towards her neighbour, Brenda. I also loved her observations about the differences between her birthplace in St. Lucia and England – the cold and rain, the English fixation about discussing the weather, the queuing, the feigned politeness, and how ‘everything in London always looks so dull’. I particularly liked her experience of attending a church service in London. ‘I sing with everyone else during the hymns, but not as loud as I might have done at home. The songs they sing in church here are all so slow.’ Rose felt so real to me in the end that it got to the point where I found myself thinking, ‘Yes, that’s exactly what Rose would do’ or ‘You go for it girl!’. Sleeping Through War is an engrossing, beautifully written novel about the challenges facing three women in a time of upheaval and change. It made me laugh, it made me cry, it taught me some things I didn’t know and it made me think. Honestly, what more do you want from a book? I wasn’t really sure what to expect when I first began reading Sleeping Through War by Jackie Carreira. I knew going in that the story centers around three women during a very volatile time in history all throughout the world. I expected perhaps that all three women would be connected somehow, but that is not the case here and I am rather glad for it. Each of the three women in this story has a distinctive voice, but they all have one thing in common. They are all learning and doing what they ne I wasn’t really sure what to expect when I first began reading Sleeping Through War by Jackie Carreira. I knew going in that the story centers around three women during a very volatile time in history all throughout the world. I expected perhaps that all three women would be connected somehow, but that is not the case here and I am rather glad for it. Each of the three women in this story has a distinctive voice, but they all have one thing in common. They are all learning and doing what they need to do in order to survive in 1968. Amalia is living in Lisbon with her young son, Carlos. She is a widow after losing her husband five years prior. Amalia wants the best life for Carlos and she makes many sacrifices in order to give him the life he deserves. Money is tight and sewing isn’t enough money to live on. So, she makes the biggest sacrifice of all in order to survive with her son. I really took to Amelia’s story. I don’t think there is anything a mother would not do for their child/children. Amalia is that mother. She does what it takes just to get by even if it means giving a little piece of herself along the way. Rose is a nurse in an elderly care facility in London. She hails from St Lucia, where she left her parents and siblings. She is caring and treats people with kindness. Something that is not always shown to her in return. She also becomes a surrogate mother to her neighbor, Brenda and Brenda’s young daughter often checking in on the both of them and offering her advice and a friendly ear. Rose may not have much but she is very giving and warm hearted. Rose may have been my favorite character of the three women. For Rose, it was a different time in the 60’s and people of color were not readily accepted in society by everyone. I don’t think she ever let it bother her all that much, though. Rose is just grateful that she has a job as a nurse, a few friends, and enough money to pay her rent and be on her own. Mrs. Johnson is a mother living in Washington, D.C. Her son is overseas fighting in Vietnam during the war. She writes heartfelt letters to her son daily where she pours out her whole heart and soul. She keeps him informed about what is going on at home and what she sees on the news. I am not a parent so I can only imagine the fear and anxiety any mother would go through knowing their child is fighting in a war. I couldn’t help but feel compassion for Mrs. Johnson and also an understanding of how these letters she writes makes her feel connected to her son. Intweaved throughout each of their stories are historically accurate snippets that bring you back to a time in our history and show just what it was like to live in 1968. I felt it really showed what each of the characters were going through during this time period and reminded us that these women were living through this every single day. It was such a time of uncertainty and you can feel it through each of their stories. Sleeping through War is a beautifully told story that is both poignant and moving. It grips you right from the beginning and you can’t help feeling for each of these women and what they are going through. Although their stories are quite different, they all struggle in their own way. This story is simply told but has so much meaning behind it. I really treasured every moment of reading it. A tightly paced and beautifully written little book, this is a fascinating slice of life during the turbulent month of May 1968, from the perspective of three very different women. Rose, a coloured nurse struggling to make sense of her new life in London. Amalia, a young widow who'll do anything to give her son a better life in Portugal, and Mrs Johnson, a mother who pours her heart and soul into her letters to her son in Vietnam. Three opposing lives, yet they are all women facing the many harsh A tightly paced and beautifully written little book, this is a fascinating slice of life during the turbulent month of May 1968, from the perspective of three very different women. Rose, a coloured nurse struggling to make sense of her new life in London. Amalia, a young widow who'll do anything to give her son a better life in Portugal, and Mrs Johnson, a mother who pours her heart and soul into her letters to her son in Vietnam. Three opposing lives, yet they are all women facing the many harsh faces of prejudice and disapproval. Inserted between each chapter, the author has included snippets of real-life news events occurring at the same time, and these served as a reflection of the bigger picture surrounding the rather insular lives of the women. I enjoyed the book very much, it was a quick read, but an interesting one, allowing me glimpses into a world that is not so long ago, yet seems so distant in terms of attitudes and morals. The author's style is crisp and sparse, not a word is wasted, yet she manages all the same to portray intense and relatable emotions. We feel for these women and grow to care intensely about them, so much so, that if I have one tiny personal criticism of the book, it's that it was over too quickly with a rather inconclusive ending. Maybe the author felt their stories were told, but it left me wanting more. I needed to know what Rose did next, how Mrs Johnson coped with the truth and what Amalia did in the aftermath of her moral epiphany. But this is just a personal observation from someone who enjoys happy endings. As a screenshot of another time and place, Sleeping Through War opens younger readers eyes and minds to what life was like during this period of social unrest, when the world was changing and hitherto unheard voices were clamouring to be heard. Sleeping Through War is a standalone book by Jackie Carreira. It was nothing like what I expected it to be, and I just can't decide if that's a good thing or not. I think for some reason I expected the three women's stories to intertwine. Perhaps the young boy coming to England from Portugal could end up a patient of the nurse in London? Or perhaps the American GI could have ended up in Portugal looking for some fun on some leave? I kept waiting for something like that to happen. By the time that Sleeping Through War is a standalone book by Jackie Carreira. I think for some reason I expected the three women's stories to intertwine. Perhaps the young boy coming to England from Portugal could end up a patient of the nurse in London? Or perhaps the American GI could have ended up in Portugal looking for some fun on some leave? I kept waiting for something like that to happen. By the time that I got closer to the end of the book and I realised that it just wasn't going to happen, I was disappointed. If I am honest I also felt really sad. The three women in this story all had such melancholy lives, even the bright moments in them were fleeting. I know this book was written wonderfully well, with such diverse and well-developed characters. Each of the women's hardships had me in tears, especially the mother of the American GI who was fighting in Vietnam. The news headlines of the times were put throughout the book too and it all melded together to paint a picture of lives in 1968. Maybe I am not intellectual enough to enjoy the book for its brilliance, because despite knowing how good it is and all that it achieves, I still prefer my books to have happy endings. At least for there to be light at the end of the tunnel. I don't think any of the women featured had that which is why I was left feeling so sad at the end of the book. I am sure many people will like and appreciate this book, I did, I just didn't enjoy it. Does that even make sense? We are introduced to the voices of three different female characters - one in London, England and two mothers, one in Washington DC and the other in Lisbon, Portugal. We quickly learn that what they have in common is that they are all living through the dramatic events of May, 1968, when most of the rest of the world seemed to be suffering from either social upheaval, student riots or 'Sleeping Through War' is a boldly-conceived and powerful debut novel from talented playwright, Jackie Carriera. We are introduced to the voices of three different female characters - one in London, England and two mothers, one in Washington DC and the other in Lisbon, Portugal. We quickly learn that what they have in common is that they are all living through the dramatic events of May, 1968, when most of the rest of the world seemed to be suffering from either social upheaval, student riots or full-scale war. By the end, we are friends with all three characters, and know them well. For me, the story was about how these women coped with loss, death and grief, and the lengths mothers will go to in order to sacrifice themselves for their offspring. Sleeping Through War is a quietly powerful novel, very cleverly narrated, honest and tender. As the blurb states this novel focuses on the lives of three women, and the narration style is different for each woman, this was so effective in giving each women a distinct voice and ensuring there is no confusion between the switching narratives. Firstly, Amalia in Lisbon, her story is narrated in third person. I didn’t take to Amalia as quickly as I took to the other two women, I think that’s because Sleeping Through War is a quietly powerful novel, very cleverly narrated, honest and tender. As the blurb states this novel focuses on the lives of three women, and the narration style is different for each woman, this was so effective in giving each women a distinct voice and ensuring there is no confusion between the switching narratives. Firstly, Amalia in Lisbon, her story is narrated in third person. I didn’t take to Amalia as quickly as I took to the other two women, I think that’s because the novel opens with her narration and I just had to get my barings and settle into the read. But over the course of the book, she grew on me, in her bid as a single mother to provide the very best for her son, Ricardo. Survival may be an act of courage, but it’s hard and it gets even harder at night-time. Next up is Rose in London, her story is narrated in first person, and was my favourite storyline. Rose, born and raised in St. Lucia, is working in London as a nurse. The use of the first-person narrative always adds a sense of intimacy, so I think that really helps the reader feel close to Rose, whereas you’re more of an observer with a third person narrative. It was just a joy to be privy to all aspects of Rose’s life: her work life, her home life, particularly her relationship with her neighbour who she adopted a mothering role with, her social life, combined with hearing about her family back home in St. Lucia, arguably makes Rose the character you get to know the best. She has a kind and caring nature, one of those people who is liked by everyone because of who they are, not because of who they’re trying to be. But what really warmed my heart with Rose was you get this real sense that she is humble, though she doesn’t have much, she is thankful for everything she does have, and she’s just looking for her little piece of happiness. Also, I loved her injections of humour, when times are bleak, humour can be a life saver. Last, but by no means least, is Mrs Johnson in Washington, her story is narrated in a series of letters to her son who is fighting in Vietnam. This storyline really added a sense of tenderness to this novel, it really portrayed how war is not only hard for those who go off to fight but for those left behind. Interspersed throughout these narratives are a series of news articles that were widely reported during the war, they feature events from around the world and are historically accurate. These really help place you in the time period the novel is set, they create a real sense of what things were like around the world during this time of war. Sleeping Through War is told to a backdrop of war and rebellion, but is the quiet, intimate story of what it is to be a woman. Jackie Carreira takes the lives of three ‘ordinary’, different women and invites us in to their struggles, their joys and sorrows, their moments of contemplation and impulses to action. There is a haunting stillness to the prose and pace, so that even as turmoil occurs in the plot, we still get a sense of strength and beauty as the women face their everyday lives with painful dignity (Amalia), practical compassion (Rose) and an achingly lonely bravery (Mrs Johnson). The three accounts are distinct not only in their setting and characters, but in the style of narrative, with Amalia’s story told in omniscient third-person style, Rose’s as a first-person account (either a memoir or oral retelling), and Mrs Johnson’s mainly through her correspondence to her soldier son. Despite these different perspectives the author binds the reader tightly to each woman with the intimate minutiae of her thoughts, feelings and actions. There are a few heart-wrenching moments along the way, relating to motherhood, loss and sacrifice that had me shedding a few tears for all of the characters involved, and there were a couple of twists that I hadn’t seen coming. Mainly though this is a glimpse into the miracle of women, ordinary women, just doing what they need to do. Making it through their lives, looking out for others, and trying to find a little kindness to spare for themselves as they go. ‘Ricardo could sleep through war,’ she thought, rising from the sofa. A thick cotton, floral curtain had separated her makeshift bed from the rest of the room and she slid it back quietly to walk through it and towards the bedroom door. Amalia moved with a tired kind of grace, slowly and smoothly around the shadows of the room: table and chairs and squat sideboard with lamp. The door opened with a low moan and she pushed it gently, just enough to poke her head inside. Sure enough, Ricardo was fast asleep; one arm under his pillow, sheet twisted around his smooth, slender legs, and his face turned away from the splashes of red that invaded the walls of his room too. ‘My beautiful boy,’ she whispered, ‘dream us some luck,’ and closed the door gently to leave him alone in his dreams. Readers first meet Amalia who lives in Portugal. She is a widow as well as a single mother, and sewing doesn’t pay the bills. She had to make choices that sadly many women have had to make throughout history to provide a better home for her child. She epitomizes what true love is for a child...giving up parts of herself to provide him with a safe environment. Many would view her as weak, but I didn’t. She was a strong woman who was doing the best she could do with the choices she was given. This is a really powerful novel that tells the story of three ordinary women, all living in different circumstances, just trying to live their own lives while the world around them is in turmoil. Each of the women Amalia who is a Portuguese single mother living in Lisbon, Rose a Jamaican nurse in a London Hospital and Mrs Johnson the mother of an American soldier living in Washington DC narrate their own story. This gives the three women their own unique voice as they describe their day to day lives. All three are similar in that their existence seems almost insignificant as they are after all just ordinary women. Each of the characters are courageous they all share a quiet dignity and inner strength, despite the melancholy that surrounds their everyday existence. You get the impression that any moment of happiness is fleeting and so needs to be embraced fully when it occurs. I spent a chunk of the book wondering how the three women’s stories would come together, what singular event would connect them? The answer is none, the book doesn’t work in this way. Instead what the three characters show you is that in many ways day to day living is the same across the world. I appreciated that each of the narrators were female as in so many ways in the 60s the female voice was still not valued. These women are living against the backdrop of the events of May 1968 and the way the news headlines are interspersed throughout helps to paint a picture of what life was like at that time. The book is beautifully descriptive, and throughout the course of it you feel as if you are making friends with each of the characters. As is often the way I think ‘ordinary’ women are often in fact the most extraordinary as they are the ones that keep the world moving through their everyday actions. This is a book that I would definitely recommend as it has three wonderful storylines that are each powerful. They each have an impact, often bleak, often heart wrenching, but always filled with a quiet optimism. Sleeping Through War isn't at all what I expected, and I don't mean it in a negative way. It's unlike anything I've read before and I heartily enjoyed it. The narrative follows the lives of three women concurrently during a volatile period in world history. Fascinating. I appreciated the detail the author poured into the narrative, focusing on the everyday lives of these women from differing backgrounds. In the beginning, I did wonder if their lives would connect at some point. However, as we begin to get to know them, it becomes clear their stories are unique and specific to them. The time-line is short; merely three weeks during May 1968. It not only highlights the newsworthy events around the world during this time in history but what happens to three ordinary women and those close to them. The narrative highlights how within a short space of time, everything can change and not always for the better. As the stories about Amalia in Lisbon, Portugal, Mrs Johnson in Washington DC, US and Rose, newly arrived in London from St Lucia unfold, these women going about their everyday lives. They struggle just as much as those affected by the wars and demonstrations at this time, only their tragedies and difficulties never get heard. As a reader, I loved the concept of Sleeping Through War. Although there isn't a physical link between these women they share a common link; all are trying their best to do what is right. One is writing to a son who is fighting in the Vietnam war. Another is trying her best to keep food on the table to care for her son after his father, her husband died fighting in the Angola War. Lastly, a lady newly arrived from the Caribbean who forms a friendship with a young single mother. Ms Carreira conveys their stories with compassionate insight. Well researched, the writing is sublime as the narrative invites the reader to pause and think not only about these world events which occurred before many of us were born but to ponder and reflect upon everyday scenarios as relevant today as they were fifty years ago. Three stories, three different women, each with a life to share, and yet, each have a common bond, protecting and worrying about those they love. Gently, and with the utmost dignity, they each allow us a glimpse into their lives so that we come to appreciate just how difficult it was to maintain any sense of normalit It’s 1968. Martin Luther King is shot dead in Memphis, Tennessee; Enoch Powell makes his notorious Rivers of Blood speech and the Vietnam War rages on, relentlessly destroying lives. I really enjoyed this story and it was definitely a book that made me think. It was well written and I really enjoyed reading about the different plotlines. It must have been interesting to have lived through the events mentioned in the book, I know a little about that time period but I loved how the author brought it to life. I enjoyed that whilst the characters for the main plots are all very different, you see the similarities from what they are going through in their own parts of the world. Although this is a work of fiction it did really make me wonder about the question the book poses – how much really has changed in the last 50 years? And for me from that, from what has changed has it really been for the better in all cases? Beautifully written and the deceptively simple language camouflages a wealth of historical detail and human emotion. The characters are so different yet they share many of the problems of the times. I particularly love novels that weave fact and fiction together in this way. I have never re-read a book immediately after finishing it, but this time I had to - can't say why as it would be a terrible spoiler! Looking forward to Jackie's next book! Absolutely adore this fabulous book! The story of three ordinary women in three countries living their lives during the life changing events of 1968. Beautifully written, thought provoking, the characters are courageous, with a dignity and inner strength that can inspire women today. I think these women are not ordinary, they're extraordinary actually! A beautifully,descriptive book with characters you fall in love with. All three personal stories are touching, powerful and heartbreaking. You cheer them on and feel their pain. A brilliant debut novel by a very talented author. I highly recommend this read! Sleeping Through War by Jackie Carreira has received a Chill with a Book Readers' Award. "I found this an absorbing read, well written with emotion and a sense of the time, 1968." A touching and informative read, about the tumultuous time it covers. I'm not soppy but it touched me! Beautifully written and insightful, I'd recommend it to anyone who likes to hear the 'small' stories of 'normal' people, living their lives within great events. In 1968 (that’s the year I was born!) three very different women are, in their own very different ways, surviving in the face of adversity. A young Portuguese widow, Amalia, is struggling to bring up her young son and make ends meet as best she can in post-colonial Lisbon. Far away in London, Rose, a nurse from St Lucia, works in a care home and deals with casual prejudice and discrimination on a daily basis. (For context, Enoch Powell has just made his notorious Rivers of Blood speech.) With peop In 1968 (that’s the year I was born!) three very different women are, in their own very different ways, surviving in the face of adversity. Far away in London, Rose, a nurse from St Lucia, works in a care home and deals with casual prejudice and discrimination on a daily basis. (For context, Enoch Powell has just made his notorious Rivers of Blood speech.) With people protesting in the streets against immigration, how much has really changed? Still further away in Washington DC, a mother writes heartfelt letters to her son fighting a faraway war. Told alternately in the third person (Amalia), the first person (Rose) and in the form of letters from Washington (I don’t think we’re ever told “mom’s” first name? ), we are drawn into the lives of the three women, who are unconnected and whose lives are very different yet who share much. All the characters were marvellous - and in many ways heartbreaking - but I think Rose was my favourite. I loved her voice, and her friendship with her young neighbour, Brenda, was hugely moving. Amalia’s story was equally moving and filled me at times with horror, rage and helplessness as I felt the impossibility of her situation. Yet all three women show great bravery, resilience and compassion. Interspersed with the narrative are news reports which impart a flavour of the time and cast light on the context of the era in which the women are living, and the broader social and political forces which affect how their lives are experienced. With a delicate and sensitive touch, through these deeply personal stories Jackie Carreira depicts the reality of women’s lives then and now. A lovely read.